The highly anticipated Alibaba stock will be coming to the New York Stock Exchange, according to a report today (Thursday) from Bloomberg. "We participated in a comprehensive and deliberate exchange selection process and we are pleased to welcome Alibaba Group to the New York Stock Exchange where they will join our network of the world's best companies and leading brands," NYSE officials said. For the Nasdaq, missing out on a huge tech company like Alibaba is a major blow to the exchange. The NYSE and Nasdaq have different regulations and charge different fees for companies that would like to be listed. The NYSE typically attracts companies with higher market capitalization than the Nasdaq, but that hasn't stopped huge tech companies like Facebook Inc. (Nasdaq: FB) and Google Inc. (Nasdaq: GOOG, GOOGL) from listing on the Nasdaq. 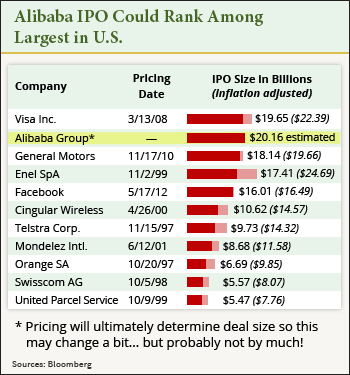 Most analysts expect the Alibaba IPO to be among the largest tech IPOs in U.S. history, and possibly even the biggest U.S. IPO ever. Some estimates place the e-commerce IPO over $20 billion, which would eclipse the $19.65 billion Visa Inc. (NYSE: V) raised in its 2008 IPO. Facebook currently holds the record for largest tech IPO, having raised $16 billion in 2012. This week, the research firm Morningstar released one of the most bullish estimates yet, claiming the Alibaba IPO could raise an astonishing $26 billion. That would make it the world's largest IPO, smashing the record $22.1 billion the Agricultural Bank of China raised in 2010. Valuation estimates on the company have topped $160 billion, and some optimistic estimates top $200 billion. Financial research company Sanford C. Bernstein has valued the Chinese firm at an incredible $230 billion.